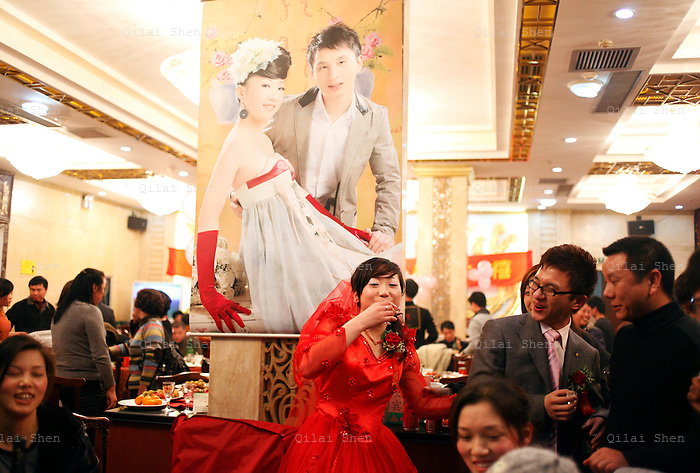 A wedding in Wenzhou, Zhejiang Province, China on 12 March 2009. The coastal city of Wenzhou and surrounding countrysides are known for its hard working private entrepreneurs and the resulting wealth. In this region marriage such as this one is a particular important occasion not only for the newly weds but also for the groom's family to show its wealth and social standing. Here the wedding banquet slowly becomes a rowdy party where guests make the newly weds drink and perform difficult acts.